What did I think of the movie? Many things! First, I was astounded by the digital cinematography! Research reveals that much of the movie was in digital format, lending itself to the creation of the natural environments of Wakanda, the Black Panther suits seemingly made of steel, vehicles, weapons, and human warfare. It was simply spectacular! There was never a lag or dull moment in the movie–from start to finish. Secondly, the cast: Not only were all of the actors and actresses extremely talented, practically all of them were African Americans. Why is this important? It wipes out the notion that mainstream movies with a black cast, are not as successful as those with a white cast–a stereotype that “bit the dust.” Talent has no color. This has been known in African American communities for decades if not a century, but many whites could not see it because they were blinded by racism. Not only is the cast predominantly black, so is Director Ryan Coogler. Coogler was born in Oakland, CA in 1986, making him a mere 32 years old. His brilliance is well-known, serving as director in movies such as Creedand Fruitvale Station before landing The Black Panther. 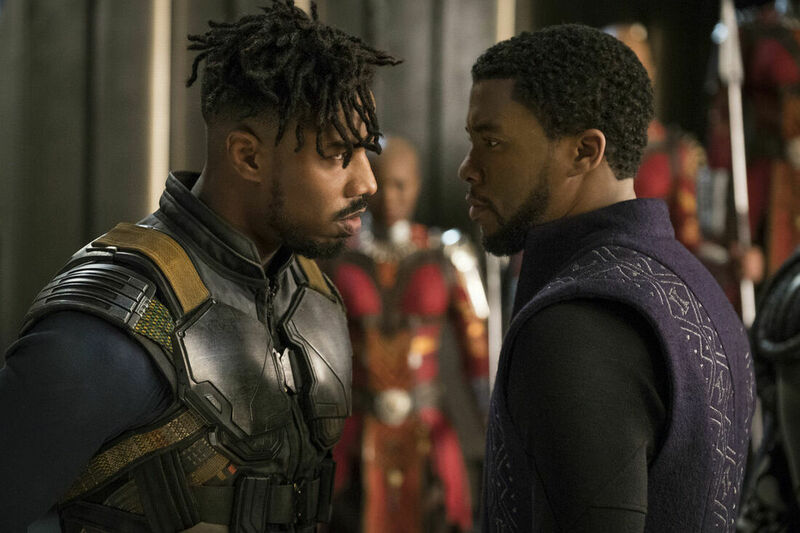 Working with actors Chadwick Boseman as T’Challa, aka The Black Panther and Michael B. Jordan as the antagonist “Killmonger” is a stroke of genius. It was elevating to see women in such authoritative roles! Tupita Nyong’o as Nakia, even though the lover of King T’Challa, is a person of immense courage and leadership. Staying home mending socks certainly was not on her radar. The female armed forces, led by General O Okoye and played by Danai Gurira, caused every observant female to sit-up and take notice. The “flips” alone were masterful. Strength is not in the body, but in the mind. Bravery has no gender, it is a quality that stems from the core of one’s being–the inner self. Why was I touched most by the movie? It was not the external things, as amazing as they were, but the articulation of unity between the African people and African Americans the movie highlighted, that gave me pause. Many blacks view Africa as not a homeland, but a land I am glad not to call home. Many Africans on the other hand, see themselves as superior to the African Americans, because they were never drafted into slavery and made to feel “less than.” They were kings and queens in their countries, while we were “field-hands and cooks” in America. This rivalry has been a wedge between the two groups for centuries. It is time for it to end. Our heritage is African … let’s claim it with pride and dignity. Neither of us is responsible for our births and carrying around this burden, changes nothing. Working together to weed out prejudice wherever found, must become the goal and mission of all men–black, white, red and yellow. I recommend “The Black Panther” as a “must see’ for all people. It will cause you to look inside of yourself and ask, “What do I really believe about myself and people in general? How do I measure myself in relation to them? Do I see myself as superior or inferior? How do I measure intelligence and where is its origin? Superheros are fantasies, but a true hero is one who sees the true man–the man not defined by color, race, gender or religion, but by honor, courage, strength and respect.